The morning of June 18th 2017 began with waking up before my husband to hurriedly write him two Father’s Day cards. One from Teddie, our two-year-old daughter, and the other from ‘Fidge’ my ever-expanding bump, in which I rather hilariously quipped something along the lines of, ‘I’ll do my best to make an appearance today…’ I was 39 weeks and 5 days pregnant and as Teddie had arrived at 41 weeks and 1 day, I didn’t really think it was a realistic premonition. Although in hindsight; and considering a large chunk of Hypnobirthing involves focusing on how the mind and the body are connected; and the subsequent role that this connection can play on a person’s birthing experience; I was a bit daft to underestimate the notion of, ‘where the mind leads, the body follows’, because bump became a baby later that day! Father’s Day continued to be a day filled with an abundance of Oxytocin*. We were in the middle of a stunning heatwave, (which of course in other countries would just be known as summer). Teddie was loving the oversized paddling pool. My husband Ian was loving the oversized hammock. I was just loving the sunshine and unknowingly taking in our last moments as a family of three… whilst also debating the possible pros and cons of using a paddling pool as a birth pool. This was a stark contrast from the previous family weekend which descended into everyone having meltdowns at a family farm! So it really is no wonder that ‘Fidge’ decided to pick the weekend on which the oxytocin, calmness, love and happiness were all flowing. Around 6pm, we started to think about dinner and ordered ourselves some pizza to arrive once we had put Teddie to bed. Although, a slightly more important detail than pizza, (if that is at all possible), is that I started complaining to Ian that I thought I had trapped wind. Ian’s face looked at me rather questioningly and I laughed off the suggestion that I was in labour and insisted it was merely trapped wind. He wanted me to call the home birth team but I didn’t want to bother them with ‘gas,’ so our compromise was to text our doula Gemma and let her know that there may be a chance I was in labour. (I am pretty sure she wasn’t expecting to hear from us as she had only popped by a couple of hours earlier to pick up my hypnobirthing book, and I definitely wasn’t in labour then). Just in case this wasn’t a case of trapped wind though, getting Teddie to bed became our biggest priority. We didn’t have a concrete plan regarding where she would go when I was in labour, so we headed upstairs, skipped bath time and snuggled up for a story. Teddie chose ‘The Ugly Duckling.’ I will never forget that she chose that book as she had never picked it out before, and has never chosen it since. But it was during this book that I soon had to stop reading and breathe through what was now clearly a contraction, (or a surge as it is called in Hypnobirthing). I gave Ian the nod to head downstairs to start filling the birth pool. I tried my hardest to continue reading Teddie her bedtime story as I was now filled with the overwhelming realisation that this would be the last time it was just the two of us, but the surges were too intense to talk through and I had to get off the bed and onto all fours. We now had a predicament with Teddie being awake and a baby on its way, so we decided that I would take over filling the birthing pool and Ian would pop Teddie in the car and get her to sleep that way. I still think about how lucky we were that that worked and we managed to transfer her into her bed as its rarely successful! I definitely got in the pool at some point as I was determined to birth this baby in it this time, as opposed to the toilet like my first birth. The pool was set up in the room that had our calming lavender burning, my affirmations and pictures of happy memories attached to fairy lights, and other soft, dim lighting, so this is where I had planned to be for the majority of labour. The environment a woman is in during labour and birth can make or break a birthing experience and I loved the calm and relaxed environment Ian and I had managed to create. Despite it feeling harder than my first labour, I still did exactly what needed to be done. As each surge started I stopped moaning to Ian or whatever I was doing at the time, and switched on my relaxing ‘up breath’ to ensure I was working with my body as the uterine muscles were drawing upwards and my cervix was dilating. I found that knowing what was happening in my body helped me to work through the intensity of each surge with the reassurance that all was working as it should be and I knew exactly what to do and what not to do. I think my biggest concern was how long I would be able to maintain this level of intensity if it continued to ramp up… but what it came down to was that I either took each surge as it came or, I gave up and who knows what the outcome would be. So, I carried on reminding myself that all of this was happening so that I could meet our baby. Throughout all of this time it was just Ian and I together as everyone else gave us the privacy we had asked for. I know I walked upstairs at one point and rather hurriedly made sure I got back downstairs again so as not to get caught out in the bathroom again, but I can remember a bit later on deciding to go upstairs a second time. I was exhausted. It was around 11pm which is way after my usual bedtime. I made it up the stairs and much to Ian’s amusement, announced that I just wanted to go to sleep. Due to this rather odd request in the middle of full blown labour, Ian knew that I must be transitioning. Women have been known to do rather strange things as the hormones in their body shift as labour changes and the baby starts to travel down the birth canal and make its way into the world. So, for all of 30 seconds I got into bed, snuggled up with my duvet, closed my eyes and then almost immediately had to get right back up again as another surge began. We went back downstairs and I finally found comfort by kneeling over my birth ball with a fan pointing directly at me. My doula, Gemma, came over to give me a sacrum pressure massage which is great for releasing tension but she hastily jumped back and away from me just as my waters broke everywhere. I remember asking if they were clear and thankfully the waters were fine and free from meconium which gave me the reassurance that Fidge was happy and not in any distress. I decided that I wanted to be back in the water as the labour was clearly progressing and with a little assistance I got back in the birth pool. At this point I also asked for some gas and air as things were really intense and I was very uncomfortable from battling the labour in the heat. My midwife Peggy asked if I was feeling any pressure and I replied that yes I was, hence why I was asking for the gas and air! Peggy was sure that baby was on its way and so ensued a hoo-ha over who was going to go and get the gas and air from the car that was parked on a different road. Eventually Gemma went but it was all in vein (sorry Gemma!) I could now feel that Fidge’s head was making an appearance. With Teddie’s birth I was far too squeamish to feel her head crowning or to use a mirror to see what was going on down below. This time though, feeling Fidge’s head was incredibly motivational and quite possibly one of the most amazing experiences of my life. 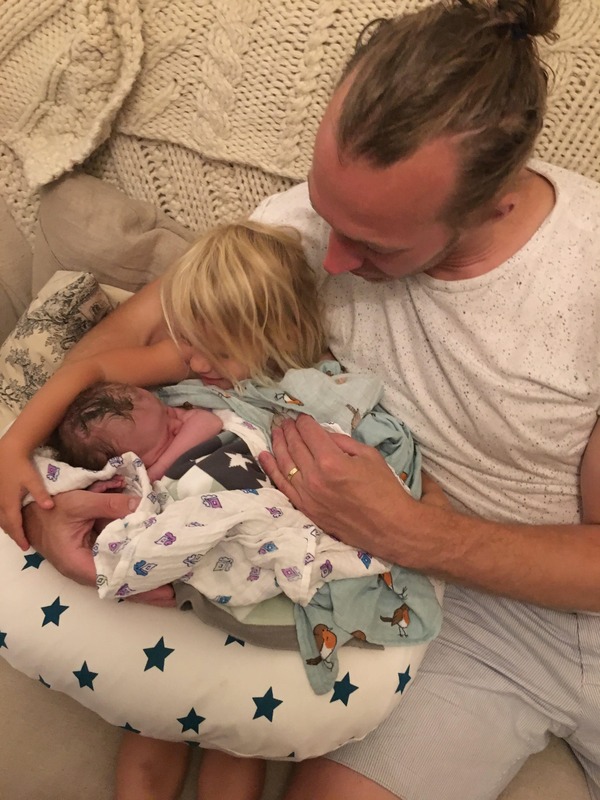 It was this part of my first labour that on reflection, I lost some control, so this time around I was determined to stay calm and ensure that I used my breath to breathe my baby out as opposed to tensing and pushing. What a difference that made! I remember feeling my baby’s head and repeating over and over again, almost like a mantra, ‘hi baby, hi baby, hi baby.’ Mixed in with that were some loud animalesque singing sounds which were great as they made sure that I was breathing and keeping my mouth open and relaxed thereby ensuring the rest of my body was also soft and relaxed too. I’m still surprised that Teddie didn’t wake up! Before too long Fidge was making their way out into the birthing pool and I had the unforgettable honour of catching my own baby, pulling them up onto my chest and announcing to Ian that Fidge was a boy! It all must have happened relatively quickly as the second midwife who attends home births didn’t arrive in time and nor did our beautiful student midwife Colleen.